This is a spiritual retreat for the whole family, where you can come and refresh your soul and get the best of both a retreat and a vacation! Attached are the registration form, the parental release form allowing your children to participate in the activities, an information flyer about the camp, and other information about the facility. If you have questions you are always welcome to contact the registrar at: sjwfamilycamp@gmail.com. For the last three years, camp has been at maximum capacity! Please send your registration and deposit in as soon as possible to reserve your space! 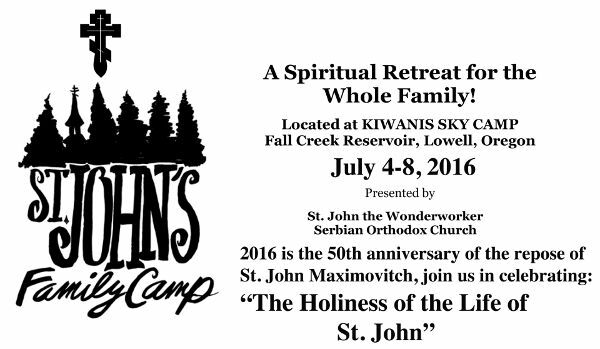 And please invite any Orthodox families or individuals who would be interested in joining our camp this year. Looking forward to seeing you all again! The early registration discount expires on June 1st! This entry was posted in camp and tagged family camp. Bookmark the permalink.